Oneida's Sant' Andrea ROYALE pattern is versatile and understated. 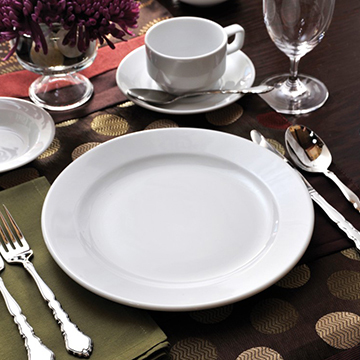 Royale's classic European styling makes a striking tabletop statement. Ideal for banquet operations Royale's flat mid-rim design provides functional and aesthetic benefits. Made of bright white, high fire porcelain this china includes limited 3-year no-chip warranty.